Marketing, or I Got A Book, Now What Do With It? It’s been a week since my last blog post, which is kind of silly given that it was the intro week of Grace Under Fire. Marketing is just a beast. Let me capitalize that. Marketing is just a Beast. As in, The Beast. It slavers at me, its jaws gaping, convincing me that if I post oooonce more on Twitter or submit to this ooooone more reviewer, that’s what is going to break things loose and cause me to become a best seller. Right? Ok, I’m not actually that naive. I do know that isn’t really the likely result. But I have to keep that in my head, because otherwise the slog of social media one dredges oneself to just for a couple of sales would really numb my skull. The sad thing about that is, it requires a set of skills almost completely different from writing the book to begin with. I have to appear to be a normal person (which I’m not, viz. my writing a fantasy novel with my wife) and send out links to the books without being a spammer. That said, there’s really no other way to get noticed. The market is flooded with self-published authors, and most of their books are not very good. This is not a knock on the authors — we would have been at the same quality level were it not for our editor, Sue Bolich. I don’t have a solution for this. But it’s a problem, and it’s one our industry is going to have to deal with in time. Grace Under Fire is Published! That’s right, book 1 of the Gift of Grace is now available! Go get em! Thank you all who helped make this happen. Now go forth and purchase! OK, Grace Under Fire is on its way. We are, I hope, done with it (apart from letting the whole world know how awesome it is, of course). 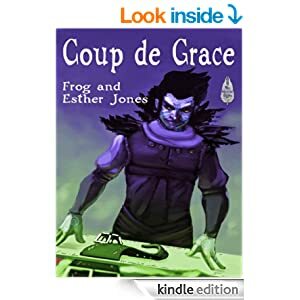 An eternity ago, at the end of July, we’d been about two-thirds of the way through Coup de Grace, the second book in the Gift of Grace series. We had the flow of the story, we were in the zone with our characters, and things were clicking along at a pretty substantial pace. Going to CampCon with Phyl Radford and friends helped a great deal as well. 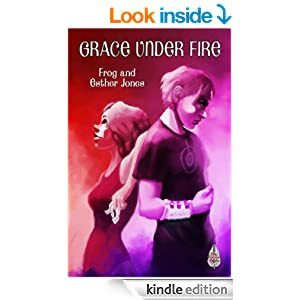 Then came August, and with it the re-writes on Grace Under Fire. Again, they were absolutely necessary. Sue Bolich did just an amazing job editing us, and the final version of the story is eons ahead of where it was. Those re-writes were totally worth the effort. But they hurt. I work a full day, and I commute for at least an hour (on a good day) each way. I’m up and out early, and home late. The latter part of August and most of September was spent massaging Grace Under Fire into its current state, and Coup de Grace was put entirely to the side. Now it’s been two months, and we’re trying to pick up our strands of thought. I know that Robert was doing…something. You know, cause…of some reason or another. Crap. I left off writing just before Robert did something climatically stupid. When I left off, I had all of Robert’s mixed-up teenage emotions in my head, and I’m trying to get back in that head space so I can actually write the scene. Coming back to a project that’s gathering dust is tough. This isn’t a “Writing Tips” post. I have no advice for anyone reading this on how to actually deal with it. Maybe next week I will. This is just me whining and writing something other than the scene in order see if blurting out my issues in blog form will help me address them. No s***, there I was. So Esther and I got our second round of edits back, not nearly so severe as the first, and we spent the weekend plugging away at them. We finally completed them Monday night and e-mailed them back to Ms. Bolich. Yesterday, we got an e-mail back. Ms. Bolich was trying to be nice with us, but it was clear she was very offended. She wanted to know whether we’d just given up, or whether we’d actually looked at all her notes and decided to blow her off. As the two of us had burned an entire weekend into responding to those notes, most of the time by agreeing with them and altering the story, we were taken aback. We thought we had done what she asked, and now she was asking us why we hadn’t. Had we completely missed the boat somewhere? Were we not understanding? Instead, we found out that Esther over there had e-mailed Ms. Bolich the wrong file. You see, my computer is being a little fritzy, so we’ve moved our shared work over to Esther’s. We downloaded Ms. Bolich’s edits onto my computer, but we made the edits based on the copy on Esther’s, just in case mine decided to completely crap out on us. Guess which file Esther sent back? Fun fact: It wasn’t the one on her own computer. You can’t see me, but my face is in my palm just thinking about it. So there’s the writing tip for the day, folks. Make sure that, once you do all the revisions, you send the right file back. If you’re wondering why Frog and I are so quiet, it’s because we’ve been furiously working on edits. While you wait for us to have something wonderful and interesting to say, here’s a beautiful new book on writing novels written by our Gears and Levers Anthology editor (We’re in vol 2 tentatively coming out in January), that is totally worth checking out: So You Want to Commit Novel. Phyllis Irene Radford has years of publishing and editing experience, and more works in print than I have time to list. She’s always a great resource and mentor. When I get a chance I’ll come back and link her blog. I promise we’ll be back soon! That’s not the whole list. Not everyone on that list is going to be in the anthology; some have more time to devote to the project than others. But I want to genuinely thank every author that’s responded with interest in the Digital Glamour world. The seed story should be out to the authors soon. If I get enough positive response, it will be posted at www.jonetales.com as a sample chapter of Digital Glamour. Esther mentions in her con post that we announced a new project at Spocon this year. That project is an exciting new shared world anthology called Digital Glamour. We’ve rounded up some talented young new authors, and we’re sharing a cyberpunk/faerie world with them. Authors will use a private online forum managed by Frog to create their stories in the world of Digital Glamour. “The 11th century, AD, was a bad time for fairies. In the West, William the Conqueror is victorious over the fey-assisted Saxons at the Battle of Hastings. The Kievan Rus complete their rise to power despite Baba Yaga’s opposition, spreading cold iron throughout Europe. In the East, Minamoto no Raiko has defeated the Shuten Doji, captain of the fey forces there. The fey take to a full retreat from humanity’s cold iron into a suspended animation state. If you’re interested in joining with other new authors and putting your own spin on the Digital Glamour anthology, e-mail me (frog@jonestales.com) and I’ll get you set up with an account for the forum and a copy of the initial short story following the adventures of Fengrahf the Troll as he tries to deal with this brave new world. After discussion with our publisher, there is a consensus that “There but for the Grace” is too bulky of a title. So we’ve changed the title of book one, which will be released this fall as “Grace Under Fire.” Book 2 is now tentatively titled “Coup de Grace,” although the way we’re going who knows what the final result of that will be.